Originally signed as Interstate 80S, the western Interstate 76 links Denver, Colorado, with Interstate 80 in southwest Nebraska as part of regional route east to Omaha. The freeway varies between four and six lanes east from I-70 to the separation with U.S. 85 at Commerce City. Commuters follow the route northeast to Brighton and Lochbuie, with the remainder of the freeway serving truckers and long distance travelers headed east to Fort Morgan, Brush and Sterling. Interstate 76 from Denver to Fort Morgan and Brush is part of High Priority Corridor 14: Heartland Expressway. 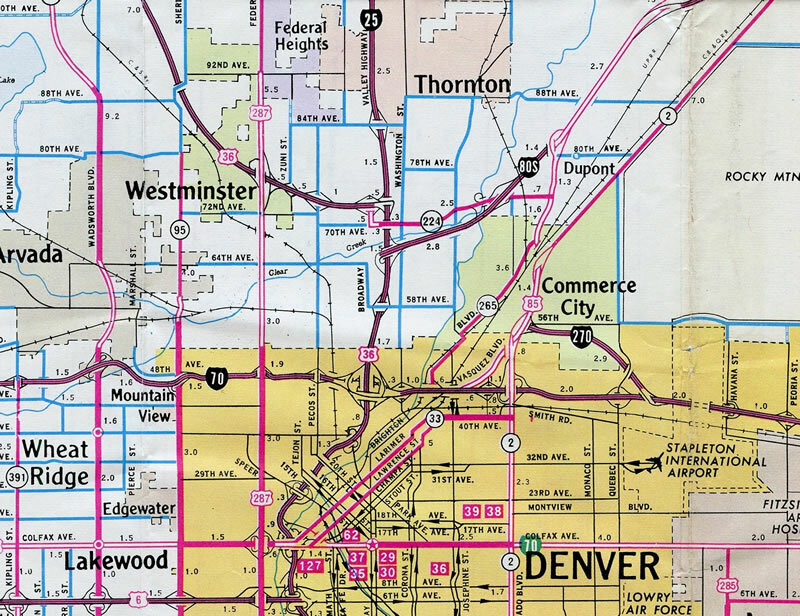 The western Interstate 76 emerges from Denver paired with U.S. 6, and the two routes remained combined until the reaching the vicinity of Fort Morgan. Northeast of Sterling, where U.S. 6 turns due east, U.S. 138 acts as the parallel route to Interstate 76 until its terminus at Big Springs, Nebraska. 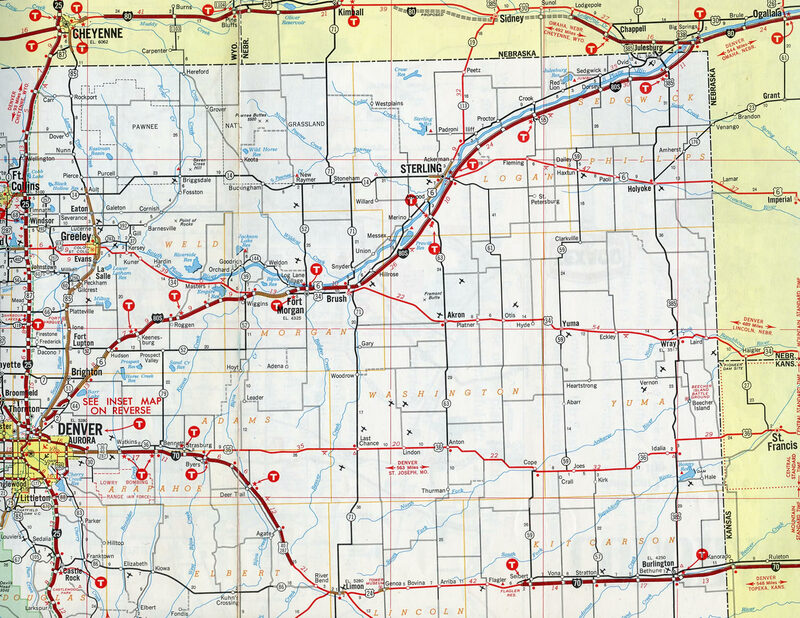 The 3.15 mile section of I-80S in Nebraska was completed in 1969.1 Interstate 80S was renumbered to Interstate 76 on January 1, 1976.2 AASHTO previously approved the redesignation on June 25, 1974, though the request referenced U.S. 6 & 50 in Grand Junction as the western extent of the renumbering. The portion west of Denver was not approved. One mile ahead of Interstate 80 (Exit 102) on I-76 east. 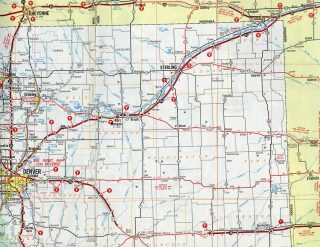 The Nebraska numbering convention for Interstate termini uses the milepost of the intersecting route. The state of Arkansas also adheres to this practice. Photo taken by Steve Hanudel (05/15/06). This Exit 102 guide sign for Interstate 80 west includes the control city of Sidney. The Cheyenne County seat of over 6,000 is 45 miles to the west at the junction with U.S. 385. Photo taken by Steve Hanudel (05/15/06). A wide trumpet interchange (Exit 102) joins the east end of Interstate 76 with I-80. The mainline defaults onto Interstate 80 eastbound toward North Platte. Photo taken by Steve Hanudel (05/15/06). An end I-76 overhead accompanies signs for I-80 east to Lincoln and Omaha and the loop ramp (Exit 102) for I-80 west to Sidney and Cheyenne, Wyoming. This sign practice is common for Interstate termini in both Nebraska and Iowa. Photo taken by Steve Hanudel (05/15/06). Leading west from Big Springs, motorists on Interstate 80 see the first sign for I-76 west. An adjacent mileage sign lists Cheyenne, Wyoming at 148 miles and Denver, Colorado at 189 miles via Interstate 76. Photo taken by Steve Hanudel (05/15/06). Replaced button copy overheads for the left-exit to Interstate 76 and the continuation of I-80 west toward Sidney. Photo taken by Steve Hanudel (05/15/06). Westbound I-80 expands to three lanes to the separation with Interstate 76 west (Exit 102). 2014 traffic counts recorded by NDOR showed traffic split somewhat evenly, with 7,625 vpd taking I-80 and 6,875 vpd on I-76. Photo taken by Steve Hanudel (05/15/06). Interstate 76 angles southwest, paralleling the South Platte River to Julesburg, Sterling and Fort Morgan. Interstate 80 continues west to meet U.S. 138 nearby. Photo taken by Steve Hanudel (05/15/06). Spanning U.S. 138 and the adjacent Union Pacific Railroad line, travelers along I-80 east continue one mile across the South Platte River to meet Interstate 76 west. Photo taken by Rich Piehl (05/01). One quarter mile ahead of the trumpet interchange (Exit 102) with Interstate 76 west back to Julesburg on I-80 east. I-76 parallels U.S. 138 southwest to Sterling. Photo taken by Rich Piehl (05/01). Exit 102 departs Interstate 80 east for I-76 west. Connections with U.S. 385 south near Julesburg lead motorists south to Holyoke, Colorado. Photo taken by Rich Piehl (05/01). Just prior to the merge with Interstate 70 west, Exit 1A departs from I-76 west and forms a distributor roadway with Exit 269A of I-70 to Colorado 121 (Wadsworth Boulevard). Photo taken by Dale Sanderson (04/01). An end shield assembly for Interstate 76 was added at the merge point with I-70 west in 2008. Photo taken by Matt Salek (04/26/08). Interstate 76 previously ended with three lanes joining I-70. The merge was rebuilt with concrete and restriped to remove the right-hand lane. Photo taken by Dale Sanderson (04/01). Heading east from SH 391 (Kipling Street) through the city of Wheat Ridge, Interstate 70 approaches back to back ramps for SH 121 (Wadsworth Boulevard) to Arvada and I-76 east to I-25 north and Commerce City. Photo taken 08/11/16. The initial guide sign for Interstate 76 (Exit 269B) on I-70 east references the connection at Exit 5 for I-25 north to Fort Collins. Subsequent signs omit I-25. Photo taken by Bruce Telfeyan (07/02). Three through lanes are allocated for Interstate 70 east into Denver as back to back lane drops occur for both Colorado 121 (Wadsworth Boulevard) and the left-exit for I-76 east. Photo taken by Bruce Telfeyan (07/02). Traffic to Colorado 121 (Wadsworth Boulevard) departs for the cities of Arvada and Wheat Ridge one quarter mile ahead of the wye interchange (Exit 269B) with Interstate 76 east. Photo taken by Bruce Telfeyan (07/02). Replaced guide signs at the eastbound split of Interstates 70 and 76. I-76 nips the northwestern corner of Denver en route to Commerce City and Brighton. Fort Morgan lies 80 miles to the northeast. Photo taken by Dale Sanderson (04/01). Interstate 76 assumes the Interstate 70 westbound control city of Grand Junction beyond the directional cloverleaf interchange (Exit 5A) with I-25 south. Prior to September 1993 all traffic was required to exit onto Interstate 25. Completion of the nearby extension of I-270 west eliminated the northbound ramp for I-25. Photo taken by Dale Sanderson (04/01). Approaching the original trumpet interchange joining Interstate 25 south with the western terminus of I-76. The state of Colorado originally used a sequential exit numbering scheme for its Interstate highways. 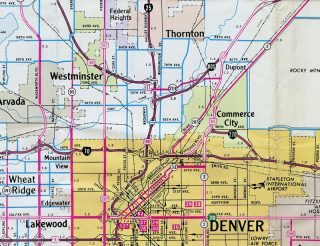 By the late 1970’s, Colorado was in a period of transition to a milepost exit numbering system. The control city was the east Denver suburb of Aurora, a community along I-70 east of Interstate 270. Photo taken by Michael Summa (1978). Construction from 1989 to September 15, 1993 expanded the interchange with Interstate 76 to include new ramps with the completed route southwest to Wheat Ridge.2 This view looks at the c/d roadway departure from I-25 north. A connection to 70th Avenue was since added. Photo taken by Dale Sanderson (04/01). Interstate 76 – 50th Anniversary of the Interstate System. Colorado Department of Transportation (CDOT). Page updated April 11, 2017.